Both Rebecca Hart and James Dwyer were recent competitors at the 2012 London Paralympics in Para-Dressage. Rebecca Hart earned a 4th in the team competition, 5th place in the freestyle, and 11th place in the individual test competition. 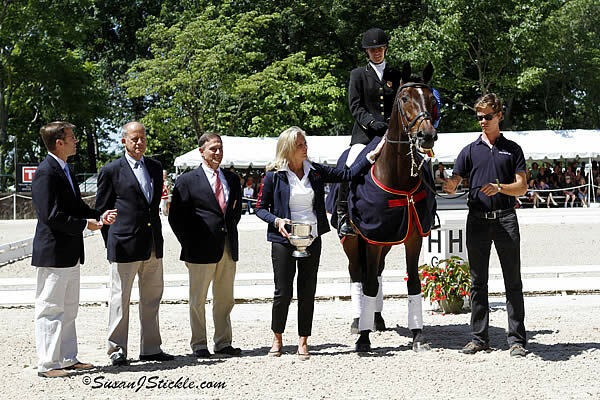 Rebecca Hart was part of the seventh-place U.S. Paralympic Team featuring the late Jonathan Wentz and NTEC Richter Scale, Donna Ponessa aboard Wes Dunham’s Western Rose, and Dale Dedrick on Bonifatius. James Dwyer was one of the four athletes representing the Bronze Medal Ireland team. Alongside James Dwyer and horse Orlando were Eilish Byrne aboard Youri, Geraldine Savage on Blues Tip Top Too, and Helen Kearney on Mister Cool. The program is scheduled on ABC’s Good Morning America Wednesday October 10th at 8 a.m. (Eastern Time). Please check your local listings for your local ABC channel. View the June 2012 press release about Ann Romney presenting Rebecca Hart her award by clicking this link. For press related inquiries, comments or questions please e-mail Lindsay McCall at Lindsay@uspea.org.